Biomedical Research Alliance of New York (BRANY) released a new research protocol template specifically designed to address the unique needs of social-behavioral-educational researchers. This launch comes as part of Protocol Builder, a secure, cloud-based protocol writing application. This special template provides a guided, step-by- step protocol-writing process for investigators who specialize in psychology, nursing, educa- tion and other disciplines that are focused on behavioral and social functioning. “Social and behavioral research is distinct from biomedical research,” said Jeffrey Cohen, Ph.D., a principal with HRP Consulting Group, a division of BRANY. “The process of writing a protocol can be more subtle than an interventional drug study, for example,” said Cohen. He explained that while biomedical researchers are generally accustomed to preparing, sub- mitting and following research protocols, social-behavioral-educational researchers are not. As a result, the protocols submitted to social, behavioral and educational institu- tional review boards (IRBs) are generally not as complete, as well-organized or as well- written as biomedical protocols. The use of a protocol template for social, behavioral and educational research should result in better protocols being submitted to the IRBs. In ad- dition, having social-behavioral-educational researchers prepare a protocol according to a protocol template helps ensure that the research, as it is being conducted, follows the protocol approved by the IRB. “Social, behavioral and educational research is much more varied than biomedical research. Standardizing research protocols does not mean that every protocol is the same, but it helps ensure that the neces- sary information relevant to the research is provided to the IRB,” Cohen said. Cynthia J. Monahan, IRB director at Harvard Catalyst, who has experience in both biomedical and social, behavioral and educational research, agreed that the two areas are very distinct, which can make studies challenging. Biomedical research is very straightforward; social, behavioral and educational research is not always quite so de nitive. “It can be extremely di cult to even identify risks in social and behavioral research, which is one of the reasons the need for streamlining processes is so great,” Monahan said. As Monahan explained, in biomedical research, a simple blood test can be ordered and utilized to check liver function, for instance. The results of that blood test are exact. The results are either in range or out of range, without debate or question. However, in social, behavioral and educa- tional research, a series of questions relating to a study might result in a particular study participant becoming upset due to a past traumatic experience, which may impact the study. Due to the different tolerances in individuals, both participants and investigators, consistency may vary greatly as a result. “The social, behavioral and educational research space may not actually be growing, but it certainly is changing,” Monahan said. In fact, there is a scientific paradigm shift occurring in behavioral and social sciences research, according to William T. Riley, Ph.D., director of the O ce of Behavioral and Social Science Research (OBSSR), part of the NIH. “The development of innovative advances in neuroscience, genetics and emerging ‘omics’ elds is enabling research that is capable of clarifying the complex dynamic mechanisms that shape the brain and behavior,” Riley said. Riley noted that there are additional complexities to social, behavioral and edu- cational research. The need to revise forms, rewrite policies and even adjust guidance documents, for example, to be more mindful of this particular research space is crucial. “Many institutions are now requesting social-behavioral protocol development templates as research in this area continues to grow,” said Kimberly Irvine, executive vice president and chief operating o cer for BRANY. According to Irvine, this new template is a response to customer requests for a tool that provides them with a more comprehensive approach to protocol devel- opment for social and behavioral research. 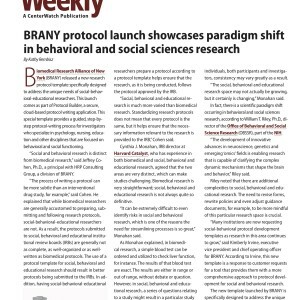 The new template launched by BRANY is specifically designed to address the unique needs of the social-behavioral-educational researchers. The template provides a guided, step-by-step protocol-writing process for investigators who specialize in psychology, nursing, education and other disciplines that are focused on behavioral and social functioning. This new NIH IND/IDE template is one of several standard and customizable templates o ered through BRANY. This template was specifically designed to improve research e ciency and quality by applying new designs that help optimize treatments by adapting them to individuals. “I see protocol templates as having potential for being particularly helpful to junior investigators in navigating the study system. In addition, they can assist all investigators by ensuring the completeness of submissions,” said Patricia A. Arean, Ph.D., licensed clinical psychologist and professor of psychiatry and behavioral sciences at the University of Washington. Arean noted the protocol templates may specifically aid in speeding up the IRB review and may also prove helpful in pilot research, speci cally minimizing errors and scienti c misconduct. In addition, templates could improve guidance, which can be lacking. At the same time, Arean indicated the possibility of protocol templates limiting researchers in their scope of questioning. “I do think there will be positive outcomes relating to protocol templates as new innovations are discovered,” said Arean. As Leslie Wilson of the Consortium of Independent Review Boards (CIRB) noted, the social, behavioral and educational research space is changing and adapting, in part due to the proposed changes to the common rule. Definite answers regarding adaptation within the social, behavioral and educa- tional research space are challenging to nd. However, the launch of a protocol template appears to be one step in the direction of growth, aided by the introduction of new research tools and advances in technology and integrative biology.